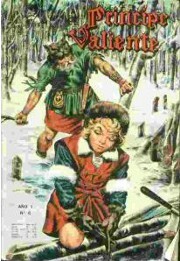 El Principe Valiente is the Spanish name for our hero. This publisher, with the beautifull name "EDITORIAL LORD COCHRANE DE CHILE", did print at least 15 magazine like books around 1965 in the Spanisch language. 32 pages per book, soft cover. These books are sold in Chile, Mexico, Argentia and sometimes in Spain. Besides this they print a Portuguese version of some of the books. These are sold in Brazil. Strange enough they started the serie in Portuguese with number 8. The first 7 numbers are never published in Portugues. All books comes with a poor graphic standard (faded colors and very bad legends translated from the Spanish). The translation occurred because the magazines were produced in the Spanish speaking Chile, and very bad adapted to the Portuguese, the language spoken in Brazil.